How do you need your space (ie: kitchen, basement, family room, bathroom, etc..) to work for you? What’s no longer working well for you in that space? Answer this question: “I would love this room if only it had:_________________________”. Every project starts with a Design Consultation in your home. With NIKKA DESIGN, it’s a working session that gives you a package of concrete professional design and decorating recommendations. By the end of the meeting, you’ll receive a preliminary design plan that could include some of the following: tile recommendations, window treatment ideas, furniture layouts, recommended sizes of furniture, colour palette, kitchen design ideas: cabinetry, appliances, counters, etc.., bathroom design, flooring, storage solutions, etc..
We assess your project scope, discuss your functional needs and show you actual product samples to consider (tile, counters, carpet, paint samples, fabrics, etc..). Finally, we also leave you with written recommendations and hand-sketched space layouts where needed. You will definitely get value for your money with NIKKA DESIGN. Having a plan gives your project focus and direction. Having a plan that works for your space, for your functional requirements and your aesthetic preferences assures that you get a customized plan. That’s how we can help you. We’ve had homeowners ask us who should they contact first, a contractor or a designer? Well, this is a biased answer, but as objectively as possible, we say a designer. Why? Because a designer will assess your needs based on the functionality that you require of a room: how’s it working for you now…? how is it not working for you? ; How does the space relate to the adjacent rooms? What’s the aesthetic style we’re after? Do you have a style? Do we need to find your style? etc, etc, etc… This is what designers deliver for their clients. Contractors don’t. We love contractors, but they’re not designers. Then, once we’ve created a design plan with specifics, only then are we ready to get quotes – realistic quotes – from contractors and vendors. With no specific plan, you’ll only receive unrealistic budget numbers. This won’t serve you well. Undertaking a redesign and renovation requires careful planning, assembling of project partners, allowing for the organic development of a design concept and the time it takes a design to be approved. We can also help you to develop a phased-in plan if that is more viable for your needs. This helps you to avoid making costly mistakes based on impulsive buys and guessing at your project requirements. On this kitchen project, we worked with a contractor and a kitchen cabinetry company – they worked together; The contractor was also renovating other rooms on this floor. 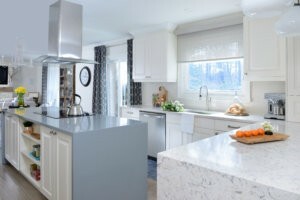 On some kitchen renovations, we might work directly with the cabinetry company; they would undertake the demolition, renovation and installation. Each project has its own requirements. Your designer will advise you on which route is the most strategic for your project. At NIKKA DESIGN, we draft for you a preliminary project budget that includes the five main categories of project costs. Does your budget capture 99% of your project costs? We can give you a comprehensive understanding of what a realistic project budget would be for your renovation and allows you to plan accordingly. Because of our extensive experience planning, designing, undertaking and managing design projects and renovations, we know how long it takes to complete a project. We plan accordingly and manage your project from pre-reno, during, through to post-reno walk-through and touch-ups. We look after your project and your home as if it’s our own. We supervise our project partners, the contractor and the various tradespeople, liaise with our vendors, schedule product deliveries and troubleshoot on your behalf. Yes, problems! Every project always has problems – one of our main goals is to solve those problems on your behalf in an efficient manner and to keep the project moving through to project completion – and to your utmost satisfaction. That’s our top priority. Please give us a call if you have questions about your renovation project this year.